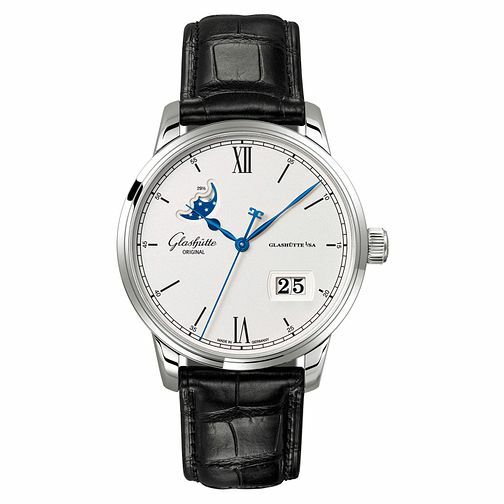 Marked by Glashutte's unique insight into the art of watchmaking, this timepiece blends together both classic and contemporary design sensibilities. Thin hands and indices are marked with classic Roman numerals at the 12 and 6 o'clock mark, with five second increments lined around the circumference of the dial for more precise timekeeping. A distinctive blue moonphase is the unique feature, allowing you to track the month with ease. The timepiece is finished with a black alligator strap and has been made with the highest standards of German watchmaking.